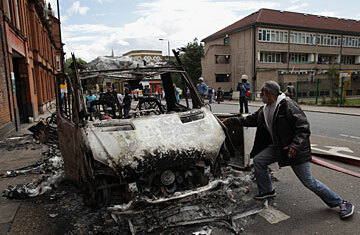 Were Twitter or BlackBerrys Used to Fan Flames of London's Riots? Even after the police arrived, the gasoline bombs kept exploding. On the evening of Aug. 6, two days after Mark Duggan, a black man, had been shot dead by police, his family staged a vigil on the streets of North London's Tottenham neighborhood. Within hours, the peaceful gathering descended into chaos, reportedly after an officer clubbed  or was said to have clubbed  a teenage girl. Mobs of hooded youth threw bicycles at police and slashed the tires of two police cars before setting them on fire. As night fell, a burning double-decker bus lit the way for other hooligans who shattered storefront windows and walked away with stolen cell phones and sneakers. Before the smell of burning rubber had even dissipated in Tottenham, havoc spread to other parts of the city. The following evening, Sunday, Aug. 7, copycat looters  acting opportunistically rather than out of any desire to avenge Duggan's death  laid siege to the North London boroughs of Enfield, Islington and Waltham Forest. Fifty vandals gathered near Oxford Circus in Central London to damage property. An additional 200 took to the streets of Brixton, in the south of the city, where they raided an electronics store and set a Foot Locker store on fire. By Monday morning, police had arrested more than 160 people and charged 16 with burglary and violent disorder. Three police officers were hospitalized. In the late afternoon, daylight skirmishes erupted in Hackney, East London, reportedly prompted by a police stop-and-search incident earlier in the day. In an age of social media in which disgruntled youth are frequently more skilled with smart phones than are the adults who police them, London authorities believe handheld technologies may have helped those trying to instigate violence to spread their message. Rather than shouting through a megaphone  as in the infamous 1985 riots on the Broadwater Estate in Tottenham  today's rabble rousers are more likely to organize online and with the aid of their iPhones and BlackBerrys. As the riots unfolded, some used Twitter to encourage violence. "Everyone up and roll to Tottenham f*** the 50 [police]. I hope 1 dead tonight," one man tweeted. Jody McIntyre, who was forcibly removed from his wheelchair by police during London demonstrations last year, asked his 9,000 Twitter followers to spread unrest across the city. "Be inspired by the scenes in #tottenham, and rise up in your neighbourhood. 100 people in every area = the way we can beat the feds." Although Twitter provides an interesting vantage point from which to watch the riots, it may be premature to suggest, as some British tabloids have, that the service somehow fueled the chaos. Sure, users retweeted an image of a burning police car 100 times during the riot, but it hardly follows automatically that this image inspired anyone to grab a crowbar and start smashing the windows of electronics stores. Jonathan Akwue, author of the blog Urban Mashup, has suggested that BlackBerry Messenger  the smart phone's instant-messaging service  may have played a more significant role in the mayhem. "People were referring to BBM as a network where they were telling people where they were going," he tells TIME, noting that references to the Tottenham riots on BBM began cropping up two days before violence broke out. "In advance of what took place Saturday, information was shared across the network." A quick search of "BBM" in Twitter suggests Akwue may be on to something. "There's a recruitment broadcast going around on bbm to gather hoodrats to start a riot," one user tweeted. "Just received 3 BBM Messages detailing a new organised 'Riot' plan complete with 'Loot Rules'. This is the start of something new. #Anarchy" wrote another. Given that BlackBerry messages are sent across private networks, it's difficult to assess the full extent and content of the messages. BlackBerry U.K. put out a statement on Twitter on Aug. 8 at 3:07 p.m.: "We feel for those impacted by the riots in London. We have engaged with the authorities to assist in any way we can." BlackBerry has targeted Britain's urban youth for years through its long-standing partnership with rapper Jay-Z and through promotional events like a BlackBerry-sponsored hip-hop concert in London on July 22. Akwue says its popularity also stems from the fact that its data packages are "all you can eat," which might explain why 37% of British teens now have a BlackBerry handset. For potential rioters, there's an added perk: the origins of messages on the BlackBerry Messenger network may be more difficult than those on Twitter for authorities to trace. As the police probe the ways in which technology may have helped spread mayhem around the city, the people of Tottenham and other affected areas are focused on recovery. The morning after the attacks in Walthamstow, local Member of Parliament Stella Creasy surveyed the damage to her community. One local supermarket lost about $100,000 after looters emptied its cash registers, while scores of smaller stores had their windows smashed and their stocks raided. Aware of the conversations taking place on Twitter, Creasy has been reaching out to her constituents through the site and has set up meetings with concerned citizens to dispel various myths. "Pure and simple, people were coming here to steal stuff they could sell," she says. "It's looting. It's not rioting." Creasy knows that messages sent via BlackBerry and Twitter may have played a part. But she doesn't want the hype surrounding social media to overshadow what matters most. "Do I think that social media is responsible? No. That's bonkers," she says. "It's ultimately the people who were doing it that are responsible. That's what we need to get to grips with."